Since Chorizo and Chiles are such a great combination, and breakfast is my favorite meal, I decided to combine them into this delicious breakfast Frittata. Roast the chiles until they are blackened on all sides by placing them directly on your burner over low heat or under the broiler. Here are instructions for roasting in the broiler. Place the chiles in a plastic storage bag and seal the bag to allow them to steam. Set aside for 15 minutes. This makes it easier to remove the skin. After 15 minutes, remove from the bag and place on a cutting board. Remove the skin by running a knife along the outside. Slice off the top of each chile and slice open. Remove the seeds (or as much of them as possible). In a medium bowl, whisk together the eggs, milk, spices and salt and pepper. Set aside. In a medium size oven proof skillet (mine was 10"), heat 1 tablespoon of canola oil. Saute the green onions and garlic. Add the chorizo and tomatoes and cook until fully cooked and the fat from the chorizo has rendered down. Remove the chorizo mixture from the skillet and wipe out the skillet. Spray the same skillet with nonstick cooking spray. Place a single layer of the hatch chiles in the skillet. Spread half of the chorizo mixture over the chiles and top with half of the cheese. Repeat the layering process one more time. Pour the egg mixture into the skillet, distributing as evenly as possible. Bake in the oven for approximately 25 minutes or until the eggs are set in the center and no longer jiggly. Remove from oven and allow to cool for 10-15 minutes before serving. Serve warm. Store any leftovers tightly wrapped in the refrigerator for up to 1 day. Reheat in the microwave. Note: I've read that some Hatch Chiles can be spicier than others and the only way to tell is by tasting them so I recommend doing a little taste test on your chiles before determing how many you want to use. Also, if Hatch Chiles are no longer in season, you can still enjoy this recipe using any other mild chile (anaheim or poblano are good substitutes). 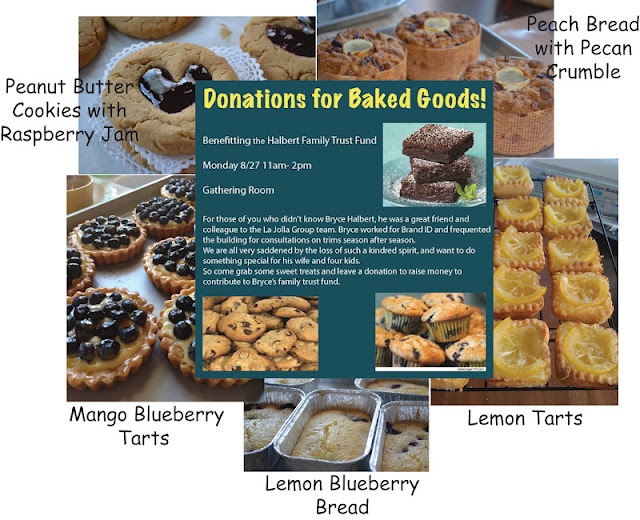 Yesterday Yvonne and I got together to make some baked goods for a Bake Sale being held at her work to benefit the family of a very special person, Bryce Halbert. I was imagining we would bake a few items and be done within a few hours (ha!). In typical "LiveBakeLove" fashion, and with Yvonne in her trademark experimental mode, we wound up baking more than expected; cute Peanut Butter Cookies topped with Raspberry Jam in the shape of a heart, delicious Peach Bread w/ Pecan Crumble Topping, gorgeous Lemon Tarts w/Cream Cheese Crust and Candied Lemon Slices, yummy Lemon Blueberry Bread w/Fresh Lemon Glaze and creamy Mango Tarts topped w/Fresh Blueberries. Today we're sharing the recipe for these Lemon Tarts with Cream Cheese Crust and Candied Lemon Slices which had to be my favorite dessert of the day. The cream cheese in the crust makes it so tender and flaky and the filling (which is super easy to make), had just the right balance of tart & sweet. The candied lemon slices were not only for visual appeal, they are completely edible and totally delicious! Using an electric hand mixer or stand mixer fitted with the paddle attachment, mix together the cream cheese, butter, sugar and salt. Add the flour and mix gently until dough is completely combined and cohesive. Remove from bowl and shape into a 1" thick disk, wrap in plastic and refrigerate for a minimum of 1 hour. In a large bowl using a hand mixer or a stand mixer fitted with the whisk attachment, whisk together the lemon juice, zest and sugar. Whisk in the eggs until completely combined then whisk in the sour cream until completely combined and smooth with no lumps. In a saucepan or small skillet, combine 1 cup of sugar with 1/2 cup of water. Bring to a simmer over medium-low heat. Carefully add the lemon slices. Simmer 3-4 minutes each side. Carefully remove slices and place on parchment paper or wax paper. 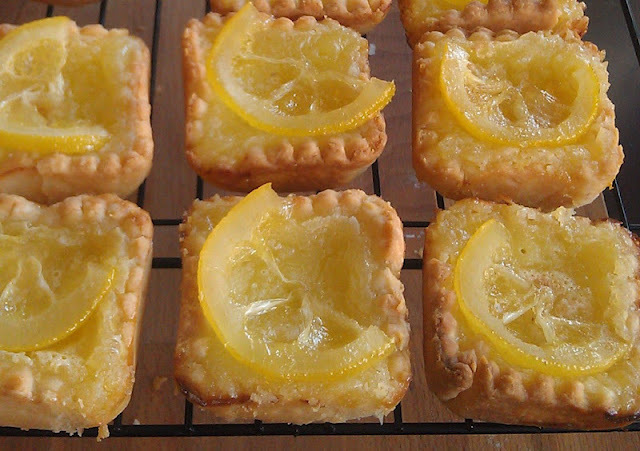 Note: You'll probably have more candied lemon slices than you need for the tarts. The leftovers would be delicious in unsweetened iced tea! Remove the dough from the refrigerator and roll out onto a lightly floured surface into a 1/8" circle. Using a biscuit cutter or any other cutting device as your template (we used a 3 1/2" fluted tart pan) cut into 12 pieces, reshaping and rerolling the dough scraps as needed. Lightly spray your baking pan. Transfer the dough circles to the baking pan and gently press them into the pan being careful not to stretch the dough. Pour the filling into each tart shell distributing evenly and filling nearly full. Bake until the crust is golden brown and the filling is set. Baking time will depend upon the size of the pan you use; regular muffin size tarts take approx 28-30 minutes. Remove from oven and top with the candied lemon slices. Allow to cool for 10 minutes before removing from pan. Remove from pan and allow to cool completely. Serve when completely cool or refrigerate before serving. Store leftovers refrigerated for up to 2 days. We've found that nice packaging of your baked goods for Bake Sales really helps with the presentation. 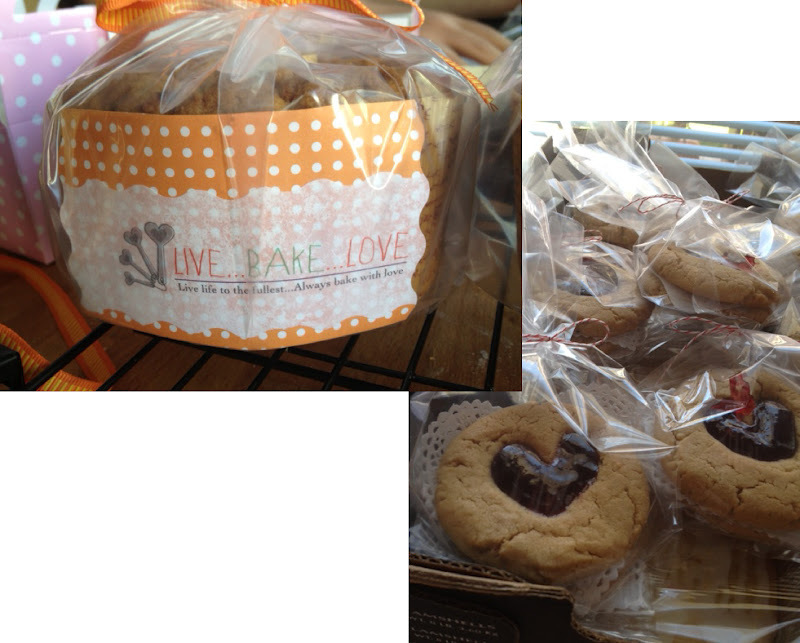 We like to pick up cute bags, ribbon and disposable baking pans whenever we find them on sale. The Peach Bread was baked in disposable paper tube pans then placed in a large ziploc bag (with the top cut off), then tied with a nice ribbon. 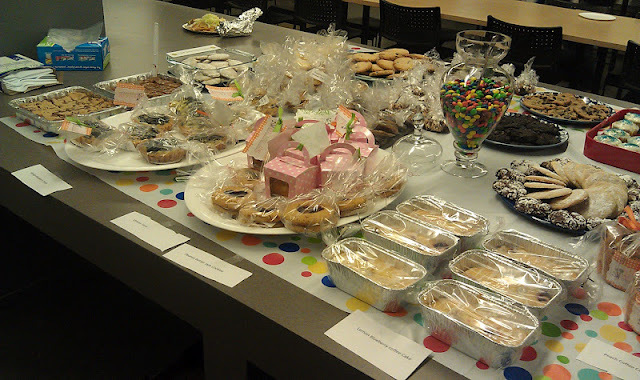 The Peanut Butter Cookies were stacked on top of heart shaped paper doiles then placed in cellophane bags and tied with baking twine. 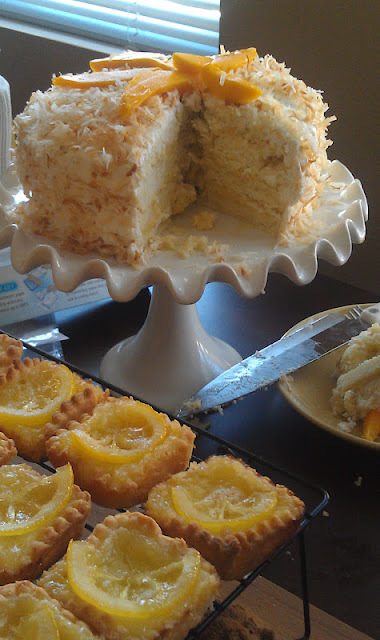 Let me start by saying, we are having a huge heat wave in Southern California, so the last thing I wanted to do was to heat up my oven, but for the sake of the blog ….. and my sweet tooth … I caved and cranked it up last Sunday. I crawled out of bed at 6 a.m. to make this recipe. It is amazing how creative you can be in the early morning once you’ve had a good cup of coffee. During the move a few weeks ago I came across a pile of recipes I had set aside - thinking I’d try them someday. I also had a few bunches of carrots left over from the week before and really wanted to use them. I had seen a bread recipe in that pile and honestly, I cannot tell you where it came from since it was typed out. I had saved it because the concept sounded interesting - Banana Carrot Bread. Once I started taking inventory of my available ingredients, I only had one problem. It was 6 A.M. ….I had no bananas and there was no way I was going to get dressed and go to the store that early! This is where the creative juices kicked in. I did have this huge, juicy mango and thought, if mashed, the mango should have a similar texture to banana. Mangos are probably right at the top of my list of favorite fruits. Tangy and sweet - perfection in a bite. After pureeing, it worked perfectly. I changed the recipe up quite a bit, but I have to tell you that this bread is DELICIOUS!!! The bread is moist and sweet and has great texture from the half cup of homemade granola I threw in there. Who would have thought mangos and carrots would mix so wonderfully together? It’s true - great flavors. You can eat it cold or right out of the oven with a little butter. I hope you try this MANGO CARROT BREAD. (TIP: for good granola, if you don’t have the time to make your own, check out your local breakfast place - many of them sell homemade granola. 1. Spray & flour a (9x5x2) loaf pan. Set aside. 2. Peel mango and puree in food processor. Set aside. 3. Grate 1 cup of carrots. Set aside. 4. Chop 1/2 cut of assorted nuts.Set aside. 5. Combine sugar, eggs, oil and butter. Mix with a whisk till smooth. 6. Add pureed mango. Mix till well blended. 7. In a separate bowl, combine flour, baking soda, baking powder, cinnamon, nutmeg and salt. Stir until all ingredients are incorporated. 8. Add Dry mix to the Wet mix, stirring with a spoon. 9. Add carrots, nuts, granola and vanilla. Mix with spoon. 11. Bake at 350 for 50-60 minutes, until middle is fully cooked. Spray an 8x8 or 9x9" square baking pan with nonstick spray. I recommend using an 8x8 pan if you have one for a taller cake. My pan was 9x9. In a small bowl, combine the flour, baking soda and salt and whisk together to combine. In a large bowl using a whisk, cream together the sugar, sour cream, egg and softened butter. Add the mashed bananas and vanilla extract and whisk to combine. Add flour mixture and whisk just until combined. Bake for 20-25 minutes or until toothpick inserted in center comes out clean. Start checking for doneness at the beginning of the bake time and do not overbake. In a large bowl, whisk together the softened butter and powdered sugar until smooth. Drizzle in the heavy cream, whisking until smooth. Stir in the vanilla bean paste until fully incorporated. Adjust consistency to your liking by adding more powdered sugar if needed. Spread frosting over the cooled cake. For easier frosting and slicing, I removed the cake from the pan and placed it on a cutting board once it was cool enough to remove without breaking. Moving…I have to say, tops the list as one of the worst activities we have to do! Yet we all have to do it at some point in our lives. This time, it was my turn …. trust me when I say I hope I never have to move again. Oh yes, I took time off work, I labeled boxes and organized as quickly as I could, but there are still missing boxes and broken glasses….and my back is killing me. But on the bright side …. I love my new house! One of the things about cooking is that most of us are inspired by our kitchen. I have to admit, my last kitchen didn’t do much to inspire me, but I was still able to create some amazing desserts and savory dishes. Well, now I have a kitchen that is a little bigger with a whole lot of natural light! I love it!!! So, the first creation from my new kitchen will be a “thank you for helping us move peeps”. I thanked them the only way I know how - I baked J! I have been wanting to make a chocolate pie ever since watching Minny dish up her famous chocolate pie in ‘The Help’. Well …. maybe not Minny’s “special pie”, but certainly Minny’s award-winning pie! I gave my Chocolate pie a little Mexican twist by adding what I consider to be chocolate’s best spice compliment - Cinnamon! I had always wondered about the Chocolate pie and let me tell you… it was delicious and super easy to make. The cinnamon whipped cream just finished off the amazing flavors. I hope you all give this recipe a try. Maybe you need to do some “thank you baking” too. 2. Lay pie dough over a 9 inch pie pan. Crimp the edges. Poke bottom with a fork, about 4 times. 3. Line the crust with foil, adding weights to hold it down. While many people use dried beans - I actually had some rocks that worked perfectly. 4. Bake for 15 minutes with the weights, then remove pan from oven. Remove the foil and weights, being careful not to burn yourself. 5. Put the crust back into the oven and bake for 5 minutes. Remove from oven and set aside. 6. For the filling: combine sugar, cocoa, flour and cinnamon in a large bowl. Mix well. Make a well in the center of the dry mix and set aside. 7. In a separate bowl, combine butter, beaten eggs, evaporated milk, half and half and vanilla. Mix with a whisk until all the ingredients are well incorporated. 8. Pour the wet ingredients into the ‘well’ of the dry ingredients. Using a large spoon, mix until smooth. 9. Pour chocolate mixture into the pie crust and bake for 50-60 minutes. The sides should be set but the middle will wiggle a little bit - that’s OK.
10. Remove from oven and set aside until completely cool. (approx. 1-2 hours). 11. Once the pie is cool, you can make the whipped cream. Combine whipping cream till it is soft peaks. Add cinnamon and vanilla. Beat at medium to high speed, until stiff peaks form. 12. Top pie with the cinnamon whipped cream. Refrigerate overnight. It’s worth the wait!!! Delicious!